The Penang Bus Map contains useful information about getting around the island. State-owned Rapid Penang is the foremost public bus operator in the state. For Rapid Penang bus routes and maps, you may get it from the official website: http://www.rapidpg.com.my/. Bus fares range from RM1.00 – RM3.00. Always carry some coins and small notes with you, as the drivers will not provide you with change. Don’t be surprised though if the buses do not leave on time; even if they may have accurate schedules; usually the bus leaves when it is half full at least. During the daytime, the buses run frequently but do be prepared to wait, sometimes for a much longer duration towards the evening. Most public transportation ends around 11:00pm and starts again around at 6:00 am – 7:00 am. There is also the free bus ride within George Town, the administrative capital of Penang and also the UNESCO World Heriate Site! Called the Hop On Central Area Transit (CAT), it is a joint effort by the Municipal Council of Penang and Rapid Penang to provide tourists to Penang a convenient way of exploring Penang’s famous landmark heritage sites. It plies the route between Weld Quay and KOMTAR on 15-minute interval from 6:00 am – 12:00 am midnight. The dark yellow / bright orange buses and vans with the text “Bas Sekolah” passing a bus stop without stopping, these buses are for school buses transporting children to their schools and will not take other passengers. The same applies to some blue buses, which take factory workers to their workplace. These buses have the text “Bas Kilang” on them. The transit places for buses are at Weld Quay (Penang Ferry Terminal) and KOMTAR. Rapid Penang provides bus service to the mainland side of Penang as well. Be sure to check the bus route carefully. Be Rapid Penang FB friend and check out the festival free ride. 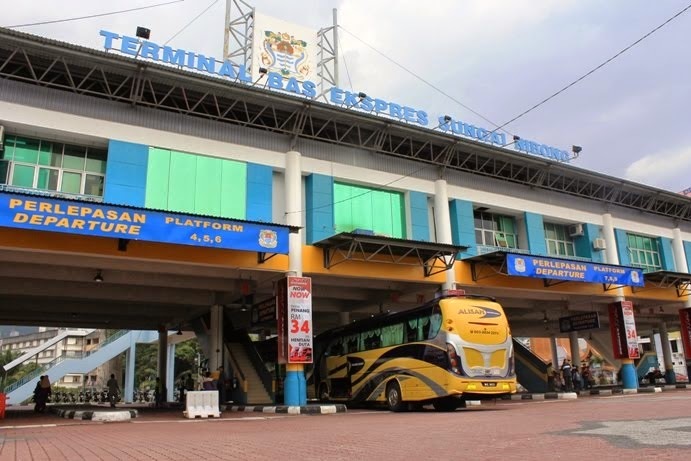 If you wish to take long-distance buses to other cities and destinations in the Peninsular, Thailand or Singapore, all you need to do is buy a ticket and board at the Sungai Nibong Express Bus Terminal, located just 5 minutes drive away from USM. The seats can be booked in advance, but you will have to go the terminal to do so.